Richard H. Collins is a Dallas native and sixth generation member of the Collins family, renowned for its many contributions to the state’s economic, political and civic growth throughout the decades. His grandfather, Carr Pritchett Collins, organized the Fidelity Union Life Insurance Company in 1927 and served as its chairman of the board and president. A leader in the insurance industry and winner of the Horatio Alger Award, Carr P. Collins was a highly successful investor. In 1925, he bought the burned out Crazy Hotel in Mineral Wells, Texas and rebuilt it. 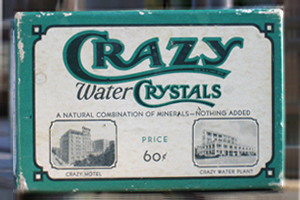 As the great depression began and hotel vacancies soared Carr P. Collins purchased time for a Texas radio show in February of 1930 to preach about the benefits of Crazy Water Crystals, a dehydrated mineral from area waters with medicinal benefits. With hillbilly music and his brother and partner Hal preaching more than selling, sales took off and Collins made his fortune during the economic collapse. 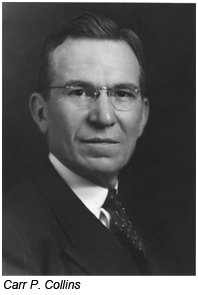 Carr P. Collins was one of the founders of the Baptist Foundation of Texas and a long-time trustee of Baylor University. He was a generous supporter of Baptist universities and charities. In addition, Carr P. Collins created the Carr P. Collins Award, given each year by the Texas Institute of Letters for the best book written by a Texas author. In 1962 he founded the Carr P. Collins Foundation which is now the Calvert K. Collins Foundation. His father, Carr P. Collins, Jr., graduated from Southern Methodist University and attended the Harvard School of Business. 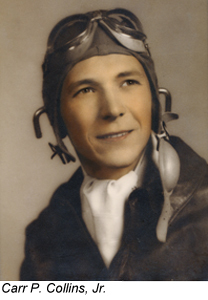 During World War II, he served in the Pacific Theater as a Major and executive officer of an air rescue squadron. He was a vice president of Fidelity Union Life and served as president of the Southwest Bank and Trust Company, Investment Trust Company, and Brinson-Collins Oil Company. His uncle, James Mitchell Collins, graduated from SMU and received MBAs from both Harvard and Northwestern University. He served as president of Fidelity Union Life Insurance Company from 1947 until 1961. A successful entrepreneur in electronics and real estate, Jim was a member of U.S. Congress from 1968 to 1983. 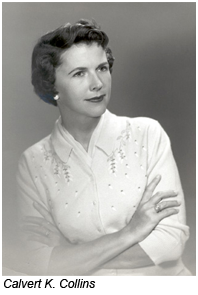 His mother, Calvert Keoun Collins, was the first woman elected to the Dallas City Council in 1957. She has always participated in the activities of her children, serving as president of the PTA, and a life member of the Texas Congress of Parents and Teachers. She was also a director of the Dallas Legal Aid Society and the Junior League of Dallas. An avid investor, she managed her own financial affairs and served as trustee for several family trusts. Her investments through the years have spanned the areas of stocks and bonds, real estate, farming and ranching. 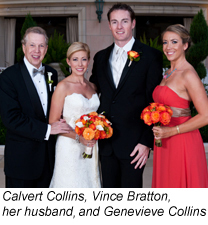 Calvert K. Collins was a director of Fidelity Union Life Insurance Company and Union Bank and Trust, both of Dallas. 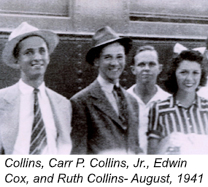 Richard H. Collins has two daughters, Calvert S. Collins and Genevieve D. Collins. Calvert is a Manager of Public Affairs of the Methodist Health System in Dallas, Texas. Calvert was a graduate of the University of Missouri and has been nominated for several Emmy Awards and won a George Foster Peabody Award. Genevieve is SVP of National Sales Co-manager for Istation in Dallas. She led her Tennessee boat to a 5th place finish in the NCAA Rowing Championships in 2008. From 1981-89, Richard H. Collins was a member of the Texas Historical Commission. From 1990-91, he was a member of the Texas Board of Criminal Justice, the entity which oversees the prison and parole systems in Texas. He serves on the board of numerous charitable organizations. A Methodist, Richard H. Collins lives in Dallas, Texas.